We welcome you to our Internet site and hope to introduce you to what we have to offer at our historic Callahan depot headquarters and museum within the depot. We are in our 43rd year of caring about the future of our past. We are an all-volunteer organization looking for like-minded individuals and businesses who share our interests. Download a membership application below and join us in celebrating and preserving our rich and diverse history. 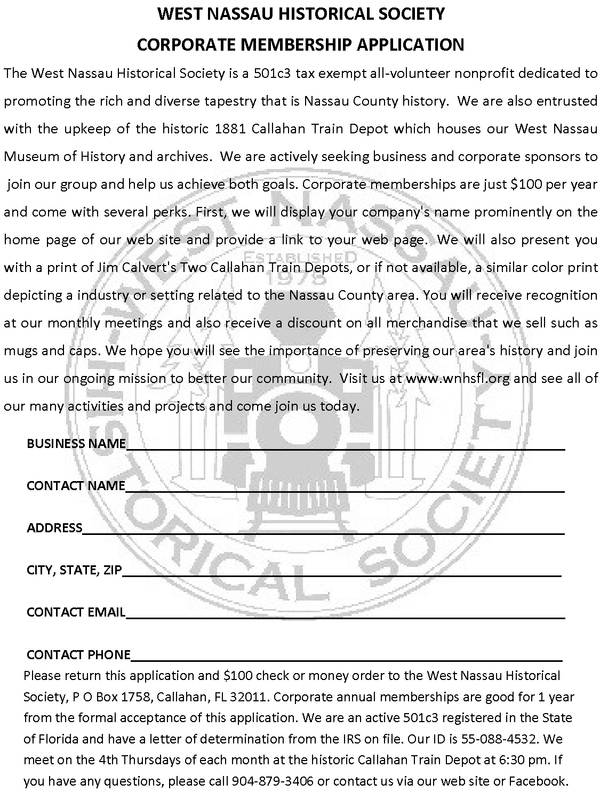 Though we are located at the historic Callahan Train Depot in the heart of western Nassau County, we like our colleagues from the Yulee Historic Council and Amelia Island Museum of History, are interested in ALL of our county's history. However, our primary focus is on the western half of the county: from the banks of the tea-colored St. Marys River to Thomas Creek, from the towns of Bryceville, Boulougne, Callahan, and Hilliard to the ghost towns of Italia, Dyal, Crawford, and Gross and the vast timberlands that lay in between. 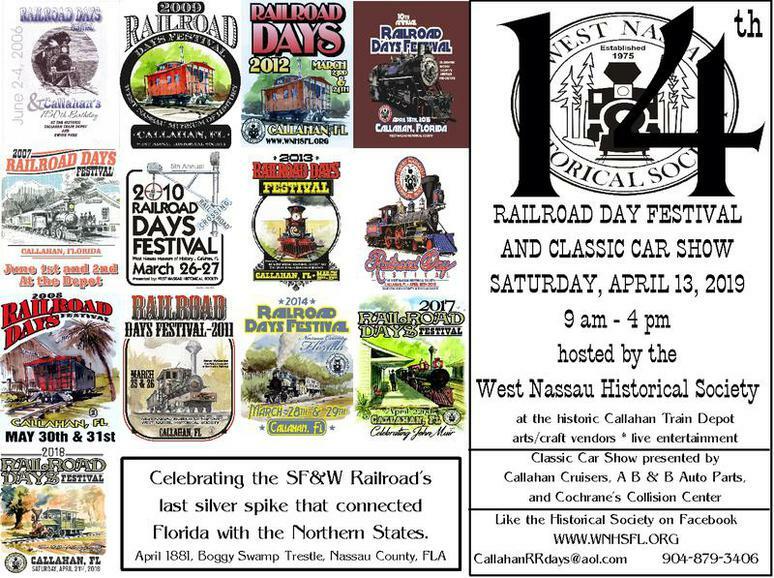 The historical society's theme is aimed at the history of the railroad which opened up the interior of Nassau County and much of the rest of the wilderness of the south and west. David Yulee's Florida Railroad began at new Fernandina, was finished through central Nassau County by mid-1856 and completed to Cedar Key by 1861. 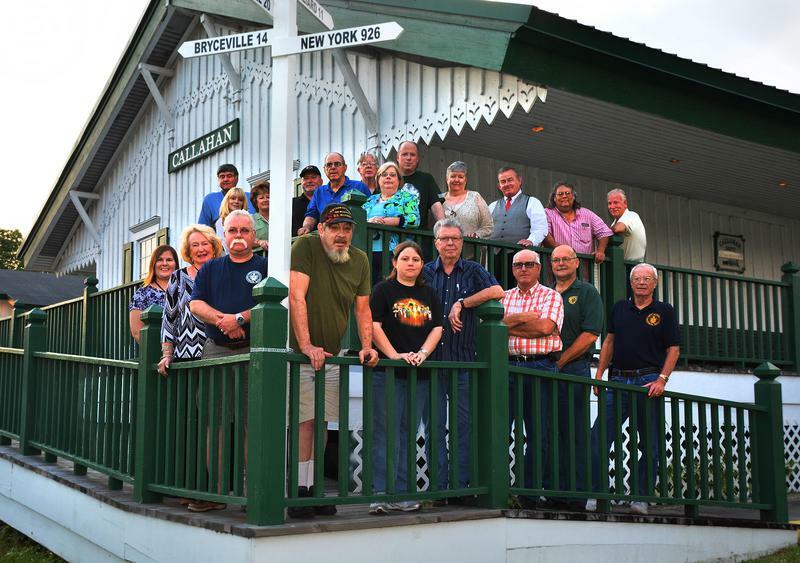 It is fortunate that one of the old railroad depots remains as the showpiece of an era gone by to help us collect, archive and display the historic gems of the past. 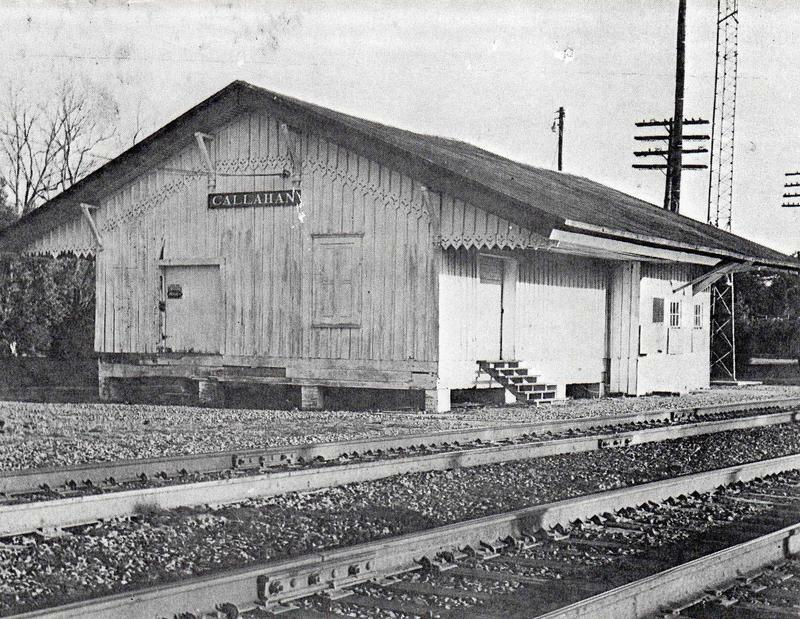 Below are pictured the two Callahan depots that stood side by side from the early 1880s until the original passenger Florida Railroad depot on the left burned about 1917. The two railroads collaborated by doubling the size of the elevated freight depot on the right, adding a clerk's office and ticket sales windows and passenger waiting rooms for white and colored on the far end. It is this building that remains as the headquarters of the West Nassau Historical Society and West Nassau Museum of History. Looking northeast with Brandies Avenue to the left and Dixie Avenue to the right. Circa 1880-1890s. Members of the society and guests gathering before the April 24, 2014 membership meeting. Copyright 2014 by the WNHS. The depot sat in this, its second location, for generations. This is the southeast corner of the intersection of CSX's north-south double track and the old Florida Railroad line that went in front of Brandies Hardware. In the 1980s, it was acquired by the historical society and underwent a $100K renovation. This end of the depot was built in 1881 of Victorian architecture. The lower opposite end was built circa 1910 and became the passenger waiting rooms and agent's office. 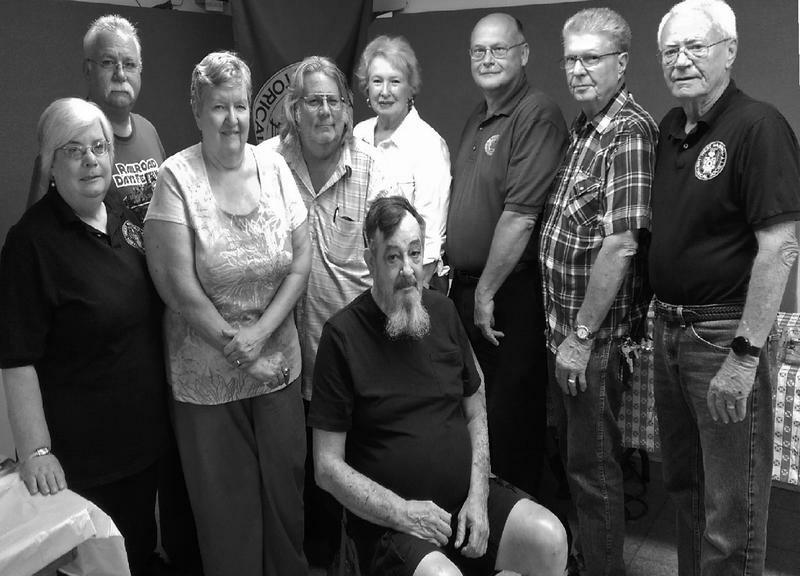 Board of Directors of the West Nassau Historical Society 2018-2019. Click here to view our 2013 educational video project documenting the many mom-and-pop motels, restaurants, and tourist attractions that once lined US 1 (Dixie Highway) in Nassau County between 1930s - 1970s on Youtube. 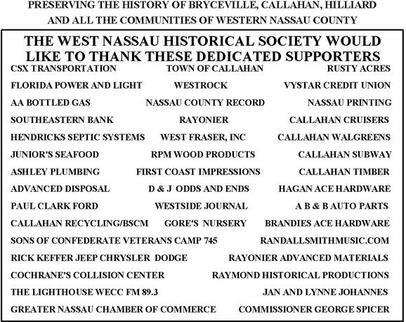 The West Nassau Historical Society is an active member of Arts and Culture Nassau, an advocacy of the arts throughout Nassau County. For more info, visit..
Click here to jump to our 2019 Nassau Art at the Callahan Depot art show page. Download art show apps and check out pictures from past NACD art shows.